PHOTO CAPTIONS: 1. 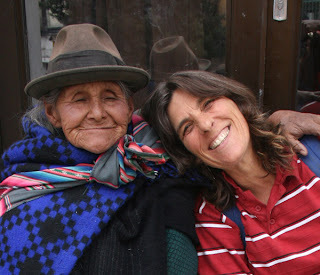 A friendly Indian woman in Potosi succeeded in selling me silver spoons, 2. 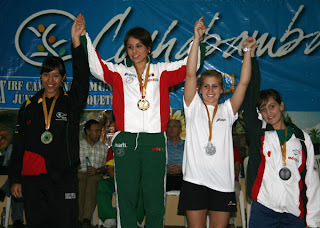 The girls 18-and-under champs in the World Junior Racquetball Championships, 3. 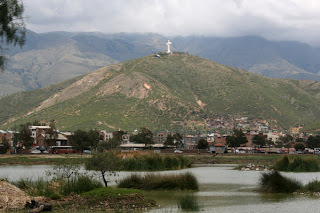 The Christ statue above Cochabamba is the highest and largest in South America. Sorry, Rio, 4. 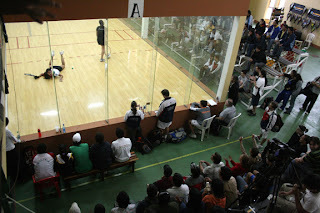 Finals action on the exhibition court at the Country Club Cochabamba where the tournament was held, 5. Mexico defeated the U.S. in Boys 18-and-under division, 6. 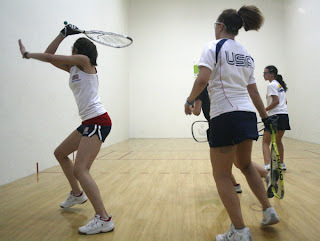 Girls doubles between Ecuador and the U.S., 7. 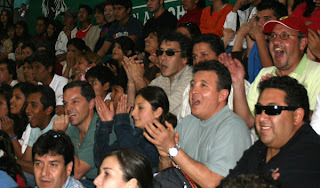 Bolivian fans turned out by the hundreds to cheer on their team. Up until we set foot in the Country Club Cochabamba, I was regretting my decision to go to Bolivia at all. It made no sense to spend so much time and money going north from Santiago, Chile, just to turn around and fly back down to Puerto Montt in southern Chile. Also, the new requirement that Americans need a $100 visa to enter Bolivia just added to my frustration. Sucre and Potosi were not what I’d remembered -- cold and dreary. It even rained a lot when we were in Sucre, and the altitude in Potosi knocked us out. We should have done more gift shopping, but for some reason I figured we could wait for the big market in Cochabamba. As it turned out, we were so busy with the racquetball tournament, we never had a chance to go shopping. So our entire collection of souvenirs is two knit caps for Andre and a small colorful pouch for his iPod.. They were very cheap and we should have bought dozens of them. Andre wanted a tablecloth for his mother, which I thought was a great idea. She would have been the only Haitian with a Bolivian tablecloth. And since I left my warm-up jacket on a bus accidentally, I’d hoped to replace it with something beautiful and interesting. But once we were at the racquetball tournament, it was all worth it. I went right to work, getting oriented, meeting the coaches and players from all the teams, photographing, interviewing. I’m always in my element at a racquetball tournament, and even more so if it’s an international event. I worried that Andre would be bored while I worked the better part of three days, but he was in heaven too. He got to do what I wish I could have, watch matches. He never tired of it and I’m sure his game is better because of it. Watching good players is one of the best ways to improve. And these kids were great! They cancelled the 6-years-old-and-under and the 8-years-old-and-under divisions, as well as mixed doubles, due to the limited number of courts. 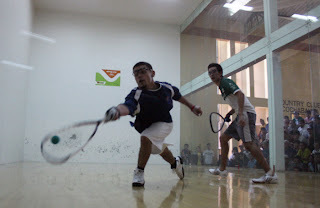 Country Club Cochabamba has tennis, horseback riding, golf, swimming, internet, massage, sauna, gymnasium – all available to the tournament participants – and 8 glass-wall racquetball courts. They’re building another facility, which will have 12 courts, but it didn’t get finished in time. President Evo Morales, a fronton player himself, is one of the investors in the new club. He came to the opening ceremonies of the World Juniors Racquetball Championships on Dec. 14, a few days before we arrived. I would have loved to meet him. I heard he mingled with the racquetball players and let them take pictures. No matter what some Bolivians think of Morales, I think it’s fabulous that they finally have an indigenous president – first one since the Spanish conquest. The hotel where all the players were staying was fully booked, so Andre and I stayed at Hostel Familiar, recommended by our taxi driver. It was nice and clean and cost $11 instead of $55. The taxi ride back and forth to the club was only $1, so it worked out just fine. It was also nice that there was Wi-Fi at the club, so I was able to do email and look up facts – like the altitude of Cochabamba, which is only 9,000 feet as compared to 14,000 in Potosi – to use in my article. After the closing ceremonies on Dec. 20, I thought we’d go to the banquet that night. But it was already 7 p.m. and we had to get up early for our four flights down to Puerto Montt the next day (Coch – La Paz – Iquique – Santiago – Puerto Montt). So we decided to skip the banquet and pack instead. As it turned out, I must have pushed my luck too far with the mercado food and street vendors. It’s not my style, but I was up all night with Inca’s revenge, back and forth to the bathroom. I must have gotten everything out of my system because I did fine the next day on our flights. We arrived at the airport along with everyone else from the tournament – 55 Americans, the whole Mexican team, the one Cuban player and his coach, and the Chilean team who traveled with us as far as Santiago. The American kids were sprawled out across the floor napping. After I took a picture of them all the parents whipped out their cameras and started snapping pictures too. It was exciting to catch the news report of the tournament on the taxi driver’s radio and again on the TV in the airport. I bought a dozen copies of the newspaper and passed them out. It featured four pages of color photos and article in Spanish, which most of the Americans couldn’t read. In the end, I was so glad that we made the heroic effort to attend the World Juniors Racquetball Tournament. Final results: Mexico captured their 6th consecutive World Juniors title, followed by the U.S. and Bolivia. Go team!